Like bishops and priests, deacons are ordained ministers of the Catholic Church that, “share in Christ's mission and grace in a special way. The sacrament of Holy Orders marks them with an imprint ("character") which cannot be removed and which configures them to Christ, who made himself the "deacon" or servant of all (Catechism of the Catholic Church, 1570).” The entire Church is called by Christ to serve, and deacons, by virtue of their sacramental ordination and through their various ministries, are to be a servant in a servant-Church. What are the characteristics of a deacon? A deacon is a man attracted to the kind of prayer that spills over into creative service to the Church. He is deeply attentive to the Scriptures as an ongoing encounter with Jesus. He loves the Church and expresses a willingness to abide by her doctrines and morals. He exhibits a desire to evangelize and publicly proclaim his love of Christ and the Church as an envoy of the bishop not merely within the liturgy, but in the fabric of his very life. Beyond this, a deacon possesses a deep desire to empower the laity in their essential role as heralds of the new evangelization, embedding himself deep within the secular world. He is willing to enter the vital work of defending the Church’s teaching on the sanctity of life and religious liberty. 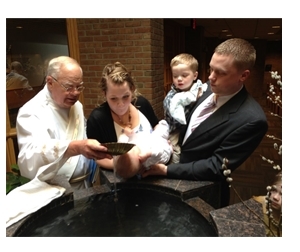 He baptizes, preaches, witnesses marriages, prays at wakes, visits the sick and counsels the spiritually troubled. Above all, he has a deep love and reverence for the Holy Eucharist. All ordained ministers in the Church are called to functions of Word, Sacrament, and Charity, but bishops, priests and deacons exercise these functions in various ways. As ministers of Word, deacons proclaim the Gospel, preach, and teach in the name of the Church. As ministers of Sacrament, deacons baptize, lead the faithful in prayer, witness marriages, and conduct wake and funeral services As ministers of Charity, deacons are leaders in identifying the needs of others. But no matter what specific functions a deacon performs; they flow from his sacramental identity. In other words, it is not only WHAT a deacon does, but WHO a deacon is, that is important. He is to be a living witness to Christ the Servant. For many years ordained ministers "ascended" from one office to another, culminating in ordination to the presbyterate, or priesthood. The Second Vatican Council (1962 – 1965), however, authorized the restoration of the diaconate as a PERMANENT order of ministry. So, while students for the priesthood are still ordained deacons prior to their ordination as priests, there are more than 18,000 deacons in the United States alone who minister in this Order permanently. There is no difference in the sacramental sign or the functions between these so-called "transitional" and "permanent deacons." Yes. The Second Vatican Council decreed that the diaconate, when it was restored as a permanent order in the hierarchy, could be opened to "mature married men, "later clarified to mean men over the age of 35. This is consistent with the ancient tradition of the Church, in which married men were ordained into ministry. Also in keeping with ancient practice is the expectation that while a married man may be ordained, an ordained man, if his wife should die, may not marry again without special permission. Currently, there are over 18,000 permanent deacons in the United States and 32,000 worldwide. The first permanent deacons in the Diocese of Joliet were ordained in 1974. Presently, 230 deacons serve our diocese in parishes, hospitals, nursing homes, prisons, and wherever the needs of people call for their ministry. Click here if you're interested in discerning the diaconate.